Timothy Dalton was playing Daniel Craig’s version of Bond before Casino Royale. License to Kill could not be more removed from any version of the character we have seen so far. Nothing about the movie is Roger Moore or Sean Connery. This is an angry, violent, vengeful spy who acts without remorse. It is refreshing and one of the best Bond films because of it. Dalton’s Bond doesn’t joke. He doesn’t look comfortable with a clever quip or a wry smile after dispatching an enemy. Dalton is all about business and we get the grittiest Bond because of it. License to Kill feels much more like an 80s thriller than an entry into the well-established Bond franchise. There are still hints at what has gone before, from ordering his usual drink to appearances by the extended “Bond family” (although Dalton has the weakest Moneypenny in the series) but these feel like lip-service as the series takes a very different direction. This is seen none more so than in the choice of villain. Robert Davi’s Franz Sanchez is one of the best Bond villains. He is menacing, scary and brutally violent. He never once feels comical and is one of the biggest threats to Bond without actually being physically superior. The way the first act builds the character is done extremely effectively, with a bold use of Felix Leiter’s character and a radical change in direction for the tone of the films. This is the first 15 certificate Bond film and it isn’t difficult to see why. The violence is brutally visual, from sharks eating limbs, people being decompressed in pressure chambers and one of the most vivid burnings you are likely to see. License to Kill drags Bond into the 90s and starts to reflect the types of action films that were being released around the beginning of the decade. This begins to have an effect on other tropes of the Bond franchise too. The Bond Girls are much more than damsels-in-distress. For starters we have a beaten victim in Talisa Soto’s Lupe but she is also a powerful character, playing the role effectively rather than as a straight victim. The opposite side of the scale is Carey Lowell as Pam Bouvier. She is actually helping Bond and undertakes the missions side-by-side with the spy. She carries a gun, attached seductively to her leg, and throws herself into the dangerous action much more than ever needing saving. It is what a Bond Girl should be and makes for a much more interesting dynamic between the two. The action takes a step up as well. The opening sequence has an impressive stunt where Bond “fishes” for a plane but it is the climax to the movie that impresses more. One particular moment where Bond improvises his driving to avoid a cruise missile is a spectacle in realistic stunts and made the more impressive because it is clearly done as live-action (as opposed to CGI). This reflects the more realistic take on the character and is the best direction that Bond can take. No more silly moments or ridiculous ideas but a more gritty, darker take on a man without a mission but out for revenge. 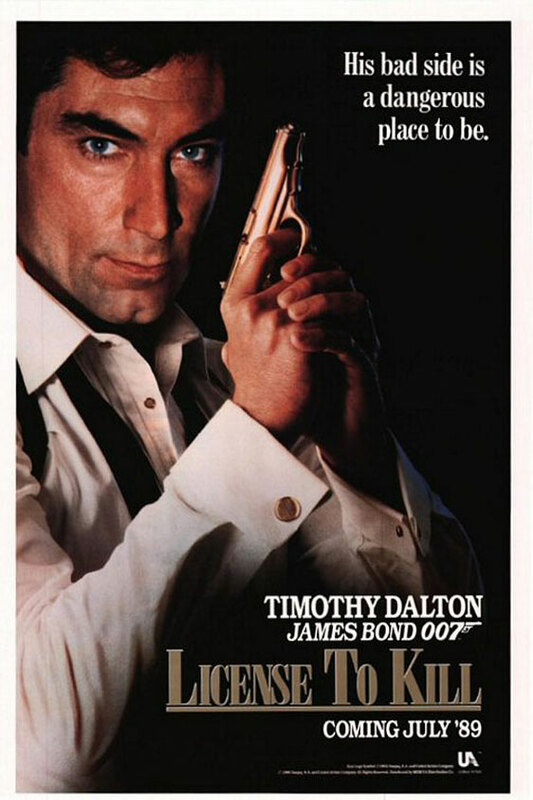 Overall, Timothy Dalton has delivered the Bond that people desperately want to see today. He is dark, serious, violent and gritty, moving away from Roger Moore’s version completely. Add to that one of the most brutal villains he has ever faced and two of the better, well-written Bond Girls and you get a radical but very welcome change in direction for the spy franchise. Dalton is playing the same Bond as Craig! Thanks. I’d never have thought of that comparison before. Aspects of Casino Royale feel very Bourne too but because Quantum lacks any depth it is a lot more noticeable.